Our topic on May 16th was The Taylor House of Drew County, Arkansas presented by Rachel Silva from the Arkansas Historic Preservation Program. Located off Hwy 138 near Winchester, the Taylor House was built in 1846 by Dr. John Taylor and his wife, Mary Robertson Taylor. This two story dogtrot style house is on the west bank of Bayou Bartholomew. It was the hub of the 11,000 acre Hollywood Plantation. 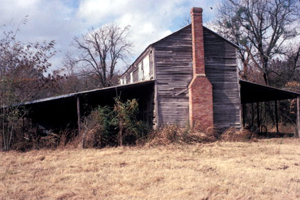 In 2012 the Taylor House was donated to the University of Arkansas at Monticello and will be used to interpret the history of one of Arkansas's earliest major cotton plantations. Participants learned of this properties long and important history and how the University plans to restore not only the Taylor House, but also other buildings on the property.